Designing and organizing a multi-day training workshop can feel a bit overwhelming at times. There are so many moving pieces, both strategically and tactically, to ensure success. You have to consider your overall learning objectives, understand your audience, design the content, make it interesting, obtain stakeholder buy-in, create an action-packed agenda that is not too overwhelming. The list goes on and on. And on top of all that, as Time notes, every eight seconds, your trainees are asking themselves, “is this a good use of my time?” So imagine having to hold someone’s attention for multiple days. But don’t fret. Here are 7 tips on how to organize a workshop so that you can get across your agenda and keep your trainees engaged. Since your trainees will be spending several days with you, it’s important to share the comprehensive workshop agenda beforehand. That way they will understand exactly how they will be spending the next few days. And, they can mentally prepare for breaks, caffeine, food, and tech checks, and schedule any work that absolutely needs to be done during the training time. With a jam-packed agenda, it’s essential to build in an hour in each morning for trainees to eat breakfast, caffeinate themselves, and prepare to learn for the day. This will increase morale and overall readiness. If you are having your breakfast catered, consider placing food outside of the classroom, so when they step foot in your classroom they are ready to learn. No one wants to train a hangry learner. Since your agenda will include content that takes place directly before lunch, have a basket of snacks in the room. If your trainees get hungry in between formal food breaks during your workshop, they can satiate their craving quickly and easily and continue learning. 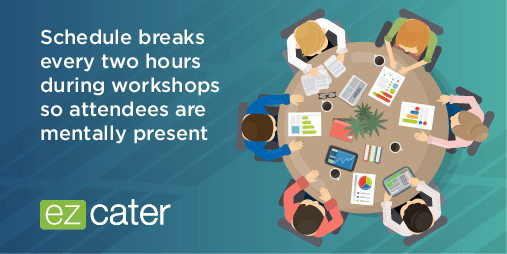 When organizing a workshop, try to figure out how to take a full hour for lunch each day. Make sure they leave the training room and go to the lunchroom, go outside, or anywhere but the classroom. Away from the main space, they can change their scenery and mentally associate the classroom with learning. Taking a formal lunch break will allow our learners to stretch their legs and take a mental break. This will allow your afternoons to be productive. After lunch, in order to wake everyone up, get them back in the learning mindset, and to avoid the dreaded post-lunch food coma, be sure to inject a high-energy activity. This will prepare them for the remainder of the workshop and get them back on the learning track. In order to ensure trainees feel less anxious about what is going on in the outside world, strategically weave in technology checks and breaks. A best practice is to build in a break, at a minimum, every 2 hours. In doing so, this will allow them to be mentally present while in your classroom and less concerned with their buzzing technology and impending to-do list. Also, if it’s a multiple-day workshop, it helps alleviate any stress over the work they may be missing. According to Neuroscience News, research shows that sleeping actually enhances overall memory retention. Organize your workshop to check for understanding of the previous day’s important concepts, at the start of the subsequent day. This will ensure your learners are grasping the core take-aways of the sessions and that you are accomplishing your overall learning objectives. Are you looking to design and how to organize a workshop for your business? See below for a sample multi-day agenda, using the best practices above, to help you get started! 12:00 p.m. – 1:00 p.m. – Time for Lunch! If you don’t have a budget for a team outing for dinner, make suggestions on places for them to go, if they are visiting from out of town! They will be more alert in your classroom tomorrow if they eat something other than hotel room pringles and gummy bears tonight! Need corporate catering for your next training event? Let us help. Want to read more about how to organize a workshop and other training tips? 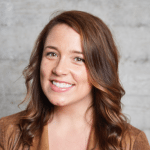 Kati Ryan has built and led award-winning training teams and programs for the past eight years, overseeing teams of trainers responsible for classroom and in-field training, as well as career development of thousands of employees. Kati is a professionally trained and engaging public speaker and subject matter expert. She has spoken at the ATD International Convention, ALI’s Employee Experience Summit, spoken on several industry roundtables, contributed content to publications such as ATD’s L&D Blog, #GirlBoss, Building the Sales Machine Blog, and been quoted in Fast Company on effective team building practices.